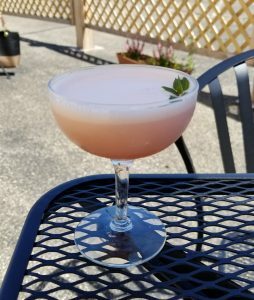 This week, we’re featuring one of the new drinks from our summer cocktail menu. We are growing chocolate mint for the season, and a drink was floating around in my head that involved our Tahitian Vanilla Vodka, fresh berries, and chocolate mint. In the end, I added a bit of lemon, and a touch of cream, and ended up with a delicious end-of-the-night type of drink (a liquid dessert, if you will). It’s on the sweeter side, but balanced with the fresh citrus and mint notes. In the end, it reminded me a bit of melted Neapolitan ice cream, so I used that idea in the drink name. Shake with ice. Double strain into a coupe glass (to remove seeds). Garnish with a sprig of chocolate mint or a berry slice/skewer.